Shaykh ‘Abdullaah Al-Ghudyaan, Member of The Council of Senior Scholars and Member of The Permanent Committee for Islamic Research and Fataawa was asked: The questioner: Is it true that there is are Ulama of Jarh wa Tadeel in todays time, is it true? The questioner: Is it present in our times? Shaikh Ghudyan: the knowledge of Jarh wa Tadeel is from the Ulama of the Hadeeth – those who conveyed to us the Ahaadeeth through isnaads present in the books of Jarh wa Tadeel – why do we need someone now? The questioner: there is someone who says that Dr.Rabee ibn Hadee al-Madkhali is the holder of the title banner of Jarh wa Tadeel? Shaikh Ghudyan: No, if he were to come across me in the street, I would not recognize him. He studied the basics of reading and writing, when young, with ‘Abdullaah Ibn ‘Abdul-‘Azeez as-Suhaymee, and ‘Abdullaah Ibn ‘Abdur-Rahmaan al-Ghayth, and Faalih ar-Roomee. He also studied the basics of fiqh, tawheed, Arabic grammar and faraa.id with Hamdaan Ibn Ahmad al-Baatil. He then travelled to Riyadh in 1363 A.H./1952 C.E., and in 1366 A.H./1955 C.E. he enrolled into al-Madrasah as-Sa’oodiyyah al-Ibtidaa.iyyah (previously known as Madrasatul-Aytaam) and graduated from there in 1368 A.H./1957 C.E. He was then appointed a teacher in al-Madrasah al-‘Azeeziyyah, and in 1371 A.H./1960 C.E. he enrolled into the Educational Institute. 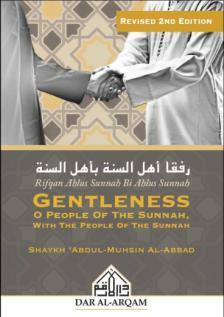 During this period he studied with Shaykh Muhammad Ibn Ibraaheem Aal ash-Shaykh. He also studied fiqh with Shaykh Sa’ood Ibn Rashood who was the (grand) judge of Riyadh, and tawheed with Shaykh Ibraaheem Ibn Sulaymaan, and Arabic grammar and faraa.id with Shaykh ‘Abdul-Lateef Ibn Ibraaheem. He then continued his studies until he graduated from the Faculty of Sharee’ah in 1372 A.H./1961 C.E. He was then appointed head of one of the courts, and then later transferred to teaching at the Educational Institute in 1378 A.H./1967 C.E. In 1380 A.H./1969 C.E. he was then appointed a teacher at the Faculty of Sharee’ah, and in 1386 A.H./1975 C.E. he was transferred to passing fatwa at the Daar al-Iftaa. In 1391 A.H./1980 C.E. he was appointed a member of The Permanent Committee for Islaamic Research and Fataawa in addition to member of the Council of Senior Scholars. ‘Abdul-Fattaah Qaaree al-Bukhaaree with whom he studied the Qur.aan in the recitation of Hafs ‘an ‘Aasim, to which the chain of transmission reaches the Messenger (sal-Allaahu `alayhe wa sallam). In addition to what has preceded of his work, from 1389 A.H./1978 C.E. to date he has been a teacher of fiqh, usool al-fiqh, al-qawaa.id al-fiqhiyyah, mustalah and hadeeth, tafseer and it’s sciences and ‘aqeedah. From 1395 A.H./1984 C.E., in addition to his work with The Permanent Committee, he gave lessons to students of knowledge in higher studies at the University of Imaam Muhammad and the Faculty of Sharee’ah in fiqh, usool al-fiqh, al-qawaa.id al-fiqhiyyah. He was also involved in supervising a number of theses at the Masters degree and Doctorate level, whilst also taking part in the (university) committee discussing theses. During this period, many students studied with him. When Shaykh ‘Abdullaah Ibn Humayd died in 1402 A.H./1991 C.E., he was undertook to giving fatwa on the radio programme “Noorun ‘alad-Darb”.